While I was getting my hair cut the other day I couldn’t help but overhear a conversation going on next to me. A man, getting his hair cut, was chatting with the hairstylist about a party he had recently attended where he was being honored for some achievement. “Of all the things they could have chosen to make for dessert in my honor, they chose to give me coconut cream pie!” He said with disgust. ‘I hate coconut, especially coconut cream pie” he said. My hairstylist’s eyes met mine in the mirror and we both smiled. ” I would have been elated at that!” I said to her. “I love coconut cream pie!” ” She agreed, saying ” I love anything coconut ! In fact, we Pacific Islanders call the coconut tree the “Tree of Life” because every part of it has something good or useful for people.” ‘Really! ” I said. Well, that was a revelation to me. I hadn’t ever heard of green coconuts before. When I got home I decided to do some research on the coconut tree and coconuts, especially on green coconuts. What I found was quite fascinating and led me to conclude that the coconut tree is truly one of the wonderful works of God. The coconut tree is said to be a “tree which gives all that is necessary for living,” because nearly all parts of the tree can be used in some manner or another. 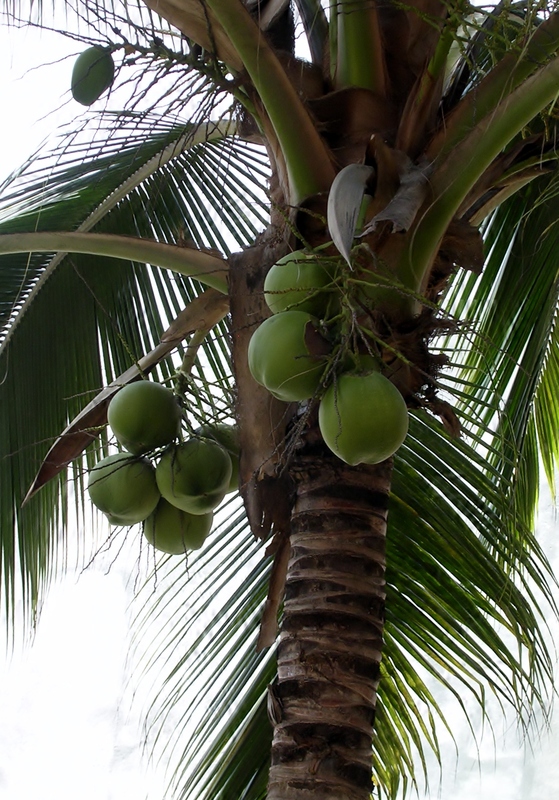 Besides the coconuts it bears, the tree’s trunk, leaves, bark and roots are used in many beneficial ways. Also, husks and shells of the coconut itself can be used. My research showed that modern science has recently unlocked secrets that reveal amazing medicinal qualities in coconuts. It is said that coconut oil possesses healing properties that are amazing. The coconut was once mistakenly believed to be unhealthy because of its high saturated fat content. I remember when I heard that quite a few years ago. I was quite disappointed because I loved coconut and to hear that I shouldn’t eat it because it was very bad for me was upsetting, however, now science has learned that the fat in coconut oil is different from most all other fats and it really very healthy! Well, don’t you know I was glad to hear that! I decided to check it out by purchasing some coconut oil to see what wonderful health benefits it could bring to me. I am delighted to say I am still learning but enjoying what I have found so far. One of my favorite uses of coconut oil is using it instead of butter or margarine on my toast. It gives the toast a taste very similar to cinnamon toast. A friend of mine uses it on popcorn instead of butter. She says the flavor is wonderful. Since the coconut tree is called “The Tree of Life” by some, and the “tree which gives all that is necessary for living” by others, I think it would be beneficial for all of us to check it out to see if those statements are indeed true. Plus, if coconut oil is supposed to be the “healthiest oil on earth” then I think we owe it to ourselves to see what benefits it might offer each of us. Young coconuts (green coconuts) and coconut oil can usually be found in your local gourmet grocery stores or Asian markets or Mexican markets. I have included some very informative links for you to check out and read further on this wonderful gift, the coconut, that God has provided to us. I hope you enjoy learning about it as much as I have. “The Tree of Life? � Wondrous Works Blog” was indeed a fantastic blog post.